This CD reissue of the 1968 LP of the same name brings back great memories of some great soul music. 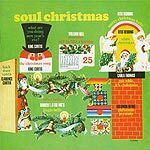 In addition to the classic tracks by Otis Redding (a mesmerizing rendition of "White Christmas," as well as a cover of "Merry Christmas Baby"), Clarence Carter ("Back Door Santa") and King Curtis ("The Christmas Song" and "What Are You Doing New Year's Eve?") are bonus tracks by Ray Charles, Carla Thomas and Booker T. and the MGs not on the original release. The cuts that work best are the two by Redding and three by Booker T. and the MGs. But there are no dogs here, and nearly every song works perfectly.